ab32123 recognises CD22 phosphorylation on Tyrosine 822. This antibody is predicted to detect splice isoform 2 based on sequence homology. WB: Ramos and Raji cell lysates treated with Pervanadate. Flow Cyt: K562 cells treated with Pervanadate. Our Abpromise guarantee covers the use of ab32123 in the following tested applications. WB 1/1000. Detects a band of approximately 150 kDa (predicted molecular weight: 95 kDa). Lane 3 : Ramos treated with 1mM pervanadate for 30 min whole cell lysate. Then the membrane was incubated with alkaline phosphatase. Dot blot analysis of CD22 (phospho Y822) phospho peptide (Lane 1) and CD22 non-phospho peptide (Lane 2) labelling CD22 (phospho Y822) with ab32123 at a dilution of 1/1000. 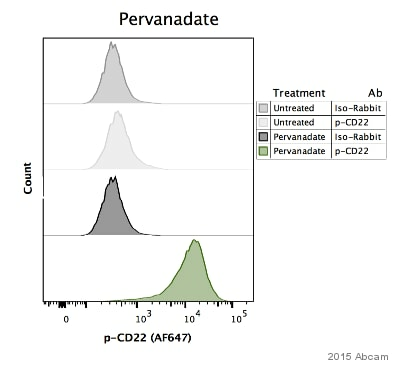 A Goat Anti-Rabbit IgG, (H+L), Peroxidase conjugated (ab97051) was used as the secondary antibody at a dilution of 1/20,000. Blocking buffer: 5% NFDM/TBST. Dilution buffer: 5% NFDM /TBST. Publishing research using ab32123? Please let us know so that we can cite the reference in this datasheet.